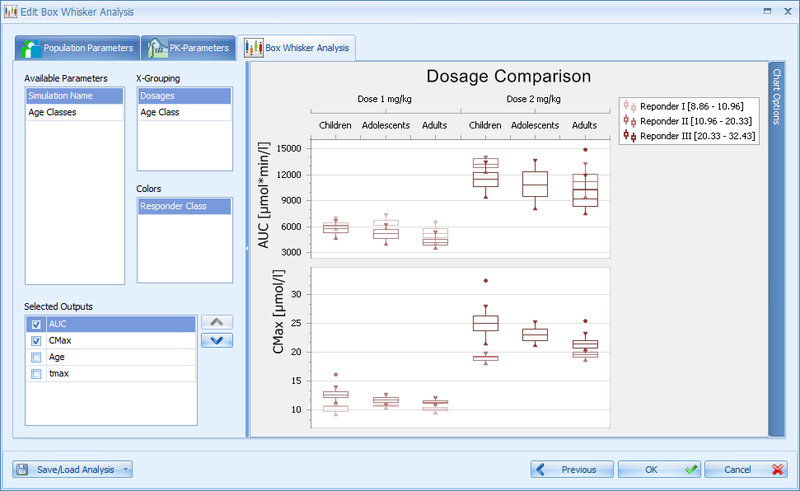 All new software releases starting with Open Systems Pharmacology Suite 7.0 can be found at Open Systems Pharmacology. Confidence Interval: Corresponds to the model error, which is based on the uncertainty of estimated parameters. This uncertainty is based on an estimation of the difference between the mean value of used observed data compared with the mean value of the (unknown) total data. 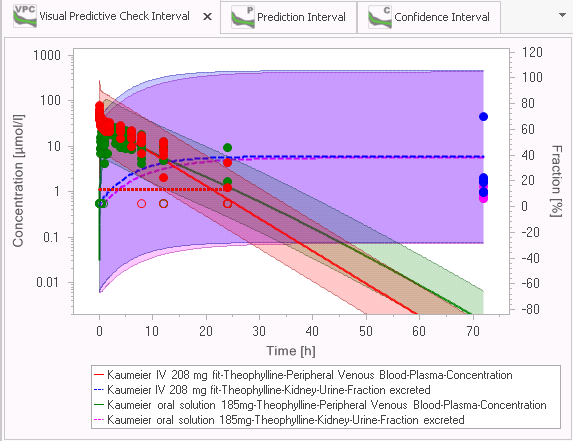 Visual Predictive Check Interval: Corresponds to the uncertainty based on the data error. The data error is the standard deviation of the distribution of the used observed data. Prediction Interval: Corresponds to the combination of the model error and the data error. It shows how much future measured data are expected to differ from the model predictions. Sensitivity of PK-Parameters (AUC, CMax, …) vs. simulation parameters. Because PBPK models can be complex and contain numerous input parameters, it would be useful to know which input parameters have the most impact on the output curves. The Sensitivity Analysis tool provides an answer to this question. Ranking of most sensitive simulation parameters. Most sensitive parameters comprise all parameters that contribute to 90% of total sensitivity. 46-7332 Parameter Identification aborted - "Do you really want to import the identified parameters?" shows only "OK"
If a simulation created in PK-Sim version before 6.1.1 containing a Hepatic or Biliary Plasma Clearance is cloned, the new simulation results may differ from the original one. This is due to the way in which the specific clearance is calculated from the plasma clearances. Intrinsic clearances are calculated from plasma clearances using the well stirred model. These intrinsic clearances are then transformed to specific clearances, which are the internal metric for clearance in PK-Sim. In PK-Sim 6.1, the method used to transform the intrinsic to specific clearance was slightly altered when using plasma clearances. Results from population simulations performed in PK-Sim version before 5.2.x cannot be reused in the current platform. The simulation can be loaded, but results need to be re-calculated. Cloning simulations in projects saved with PK-Sim version before 5.4.1 may reset some non-formula parameters to default value (#47-6141). 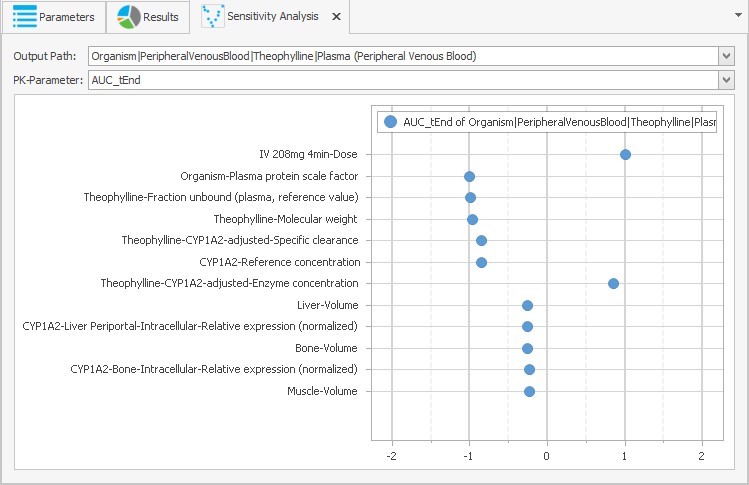 Parameter Identification (PI) fully integrated into both PK-Sim and MoBi (detailed description in Chapter 34 of the Computational Biology Software Suite Manual 6.2). New compounds, individuals, formulations and application protocols are delivered with the integrated compound database. 46-7251 "Manage user display units" has no effect on table formulas. If observed data was saved as template, it is not allowed to reload it in the same project (otherwise the project will become corrupted). This applies for both, PK-Sim and MoBi. If a simulation created in PK-Sim version before 6.1.1 containing a Hepatic or Biliary Plasma Clearance is cloned, the new simulation results may differ from the original one. This is due to the way in which the specific clearance is calculated from the plasma clearances. Intrinsic clearances are calculated from plasma clearances using the well stirred model. These intrinsic clearances are then transformed to specific clearances, which are the internal metric for clearance in PK-Sim. In PK-Sim 6.1, the method used to transform the intrinsic to specific clearance has been slightly altered when using plasma clearances. 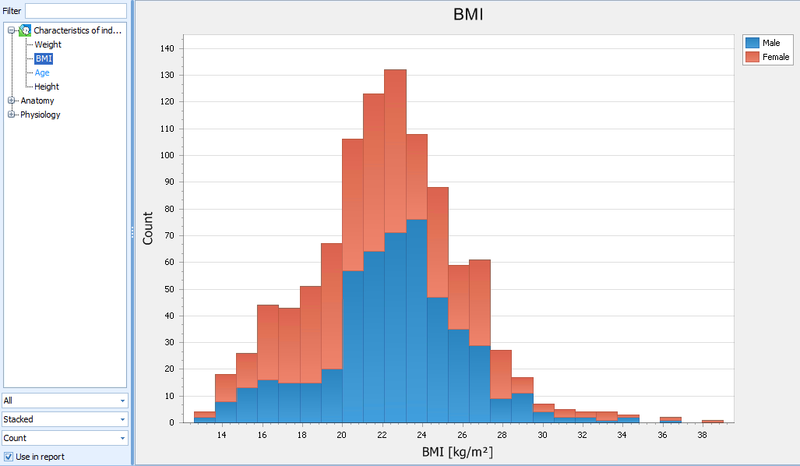 Sensitivity values might be wrong in case of weights unequal 1. If NaN values are part of an observed data set, the parameter identification cannot handle this reasonably. NaN values should be manually removed from an observed data set before using it in PI. New option “Use as suspension” introduced for Weibull, Lint80, Table and Particles Dissolution formulations. If this option is selected, in the simulation, the tablet will disintegrate in the stomach and the disintegrated particles will migrate along the gastrointestinal tract compartments. The drug release from the particles will depend on the dissolution process selected (Weibull / Table / Particle Dissolution / …). If this option is not selected, the tablet will be treated as non-disintegrating tablet with discrete transition in the different gastrointestinal tract compartments. New compounds are delivered with the integrated compound database. 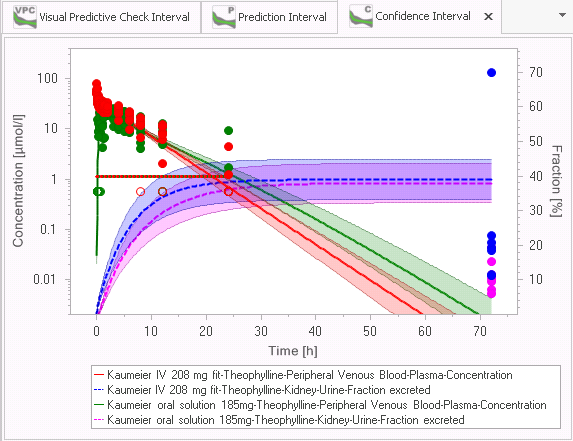 The negative values check for molecule amounts was introduced in order to warn the user in case some unphysiological negative values are generated in a simulation (e.g. as a result of bad model parametrization). Per default, all molecule amounts are assumed to be nonnegative. This default setting can be overridden in the molecule start values building block in MoBi. o 47-7518 Name of compound associated with observed data during the import should be visible. o 47-7596 Cannot create a user defined administration protocol with target organ "Liver". o 46-6854 Error loading a simulation if it is already present. o 46-7046 Configure ignores chosen building block when updating. o 46-6670 Exception when importing observed data from an excel-file without entries. o 46-7153 Changing container criteria of a reaction is not recognized as a change in existing simulations. o 46-6659 Parameter Start Values are not applied correctly. o 46-7065 No way to load an application if an equally named is present. o 46-7030 "System.OutOfMemory” exception when deleting too many parameter start values. o 46-6085 If I change the display units and click "Update", the Chart in the simulation result window remains on those units that were set prior to the simulation. It needs to be re-simulated to be able to get the new units. o 46-5448 Value of a discrete distributed parameter cannot be changed after "Reset to Default"
o 46-6404 Simulation tree will not open containers after "search"
o 46-6615 Navigating through the list of reactions does not update the "Properties"-frame. · If observed data was saved as template, it is not allowed to reload it in the same project (otherwise the project will become corrupted). This applies both for PK-Sim and MoBi. · Changes in Hepatic and Biliary Plasma Clearances: If a clone of a previous-version simulation containing a Hepatic or Biliary Plasma Clearance is done, the new simulation results may differ from the original simulation. This is due to the way in which the specific clearance was, and is now, calculated from these plasma clearances. Intrinsic clearances are calculated from plasma clearances using the well stirred model. These intrinsic clearances are then transformed to specific clearances, which is the internal metric for clearance in PK-Sim. The method used to transform the intrinsic to specific clearance has been slightly altered when using plasma clearances. · Results from population simulations performed in PK-Sim version before 5.2.x cannot be reused in the current platform. The simulation can be loaded, but results need to be re-calculated. · The former Matlab-based population simulation toolbox also supported a parameter sensitivity analysis. This feature was decommissioned. Now, sensitivity analyses have to be performed using R or the Matlab Toolbox. We are happy to help out, if you need support, please contact customer support. · Cloning simulations in projects saved with PK-Sim version before 5.4.1 may reset some non-formula parameters to default value (#47-6141). 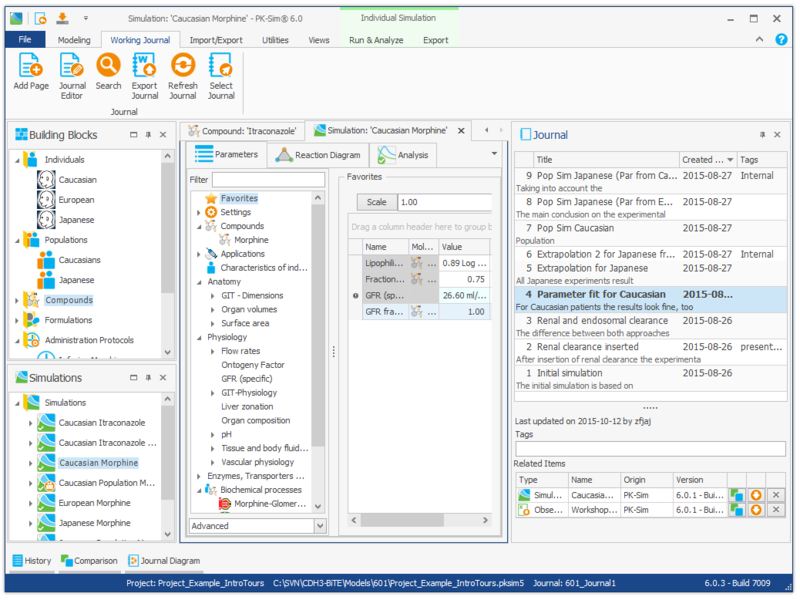 A Working Journal can be shared among several PK-Sim and MoBi project files, so one unique journal can be used within your project even if you use different project files. This makes the Working Journal the ideal tool to connect your thoughts and ideas with your model. Even different users can access the same Working Journal at the same time - but only one user can edit a Journal Page at a time. After each important work step, intermediate results or decision points can and should be added in a Journal Page to the Journal. This should include the result, the input values, and description of decisions. 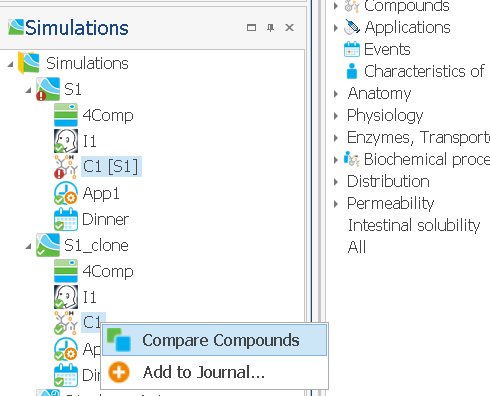 For instance, the values of the favorite parameters and result charts can be copied into the Working Journal by copy & paste and corresponding simulations and building blocks can be attached to the Journal Page directly from the context menu. The comparison of building blocks and simulations can help to compare different versions of a model for e.g. reporting purposes. Alterations of individual building blocks can be seen at a glance. Converting models can also lead to alterations in building blocks. This can be the case, if one version of a model uses a functionality of PK-Sim that was not available in the older version. A further, rather special case is a listing of extended start values upon comparison. 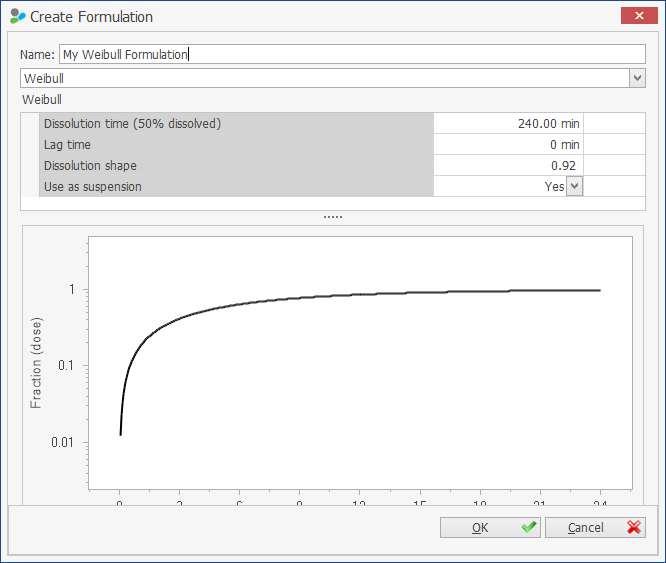 If parameter or molecule start values are incomplete in MoBi, they are extended during the Create Simulation process. These amended start values will be listed if the respective building blocks before and after creation of a simulation are compared. 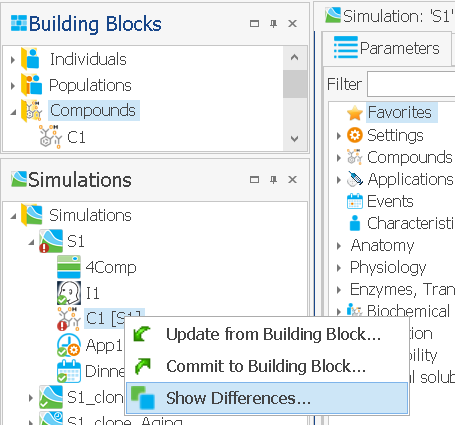 Comparison of building blocks can also be done within a simulation when a building has been altered and the differences to the original version need to be known. Standard Chart and Font sizes can be defined for export of charts. After definition of Chart Export Options, charts are always exported in the same size to e.g. Working Journal or slides, independent of the current chart size and of whether preview was selected in the application. User defined templates can be stored for reuse in other simulations. can be created from or applied to the current chart. 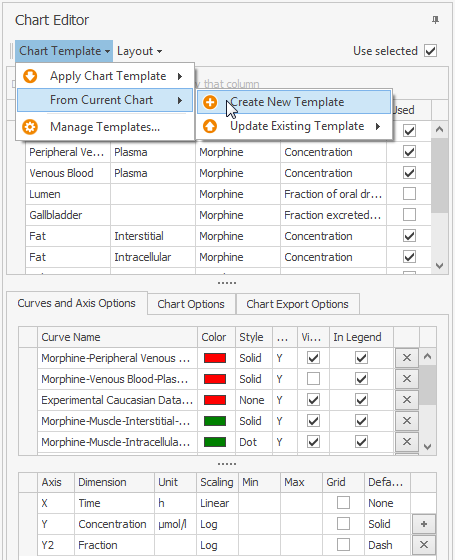 Chart settings (Chart Options and Chart Export Options, Curve and Axes Options) can be saved in different Chart Templates and reused in a simulation. Display units can be chosen for a dimension in a project and for a user. In addition, a default display unit for each dimension can be defined. 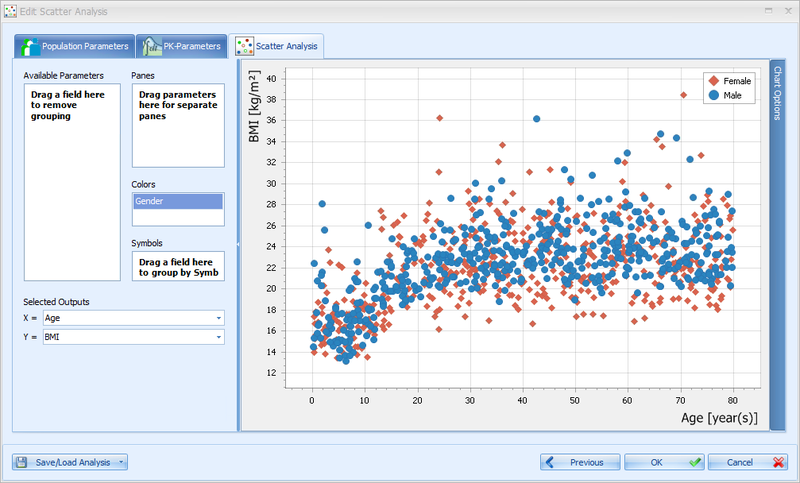 The set of analyses in a population simulation can be saved as template and applied to another population simulation. SBML models starting from Level 2 Version 1 can be imported as building blocks from which a MoBi model can be created. o 47-7249 Ontogeny factor plots: additional explanation of what the variability consists of should be shown. o 47-7372 Ticks for logarithmic plots in population simulation charts are wrong. o 46-6736 y-Axis assignment of observed data is lost after simulation. 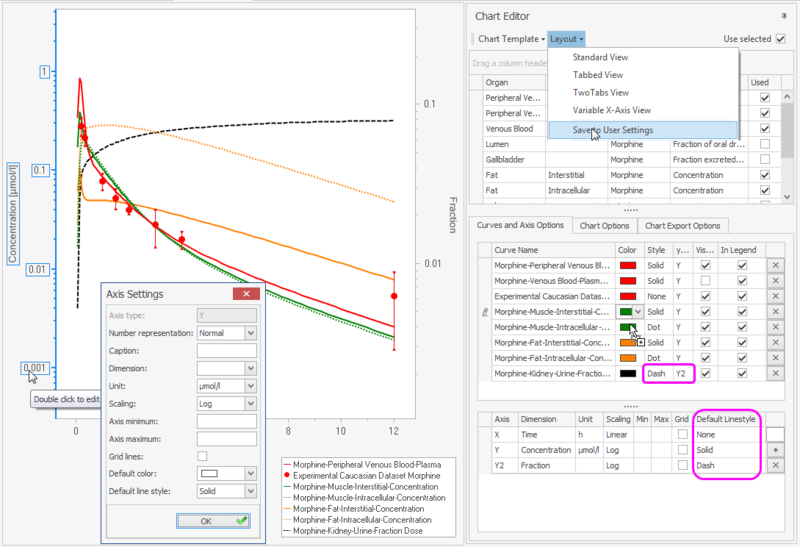 · The former Matlab-based population simulation toolbox also supported a parameter sensitivity analysis. This feature was decommissioned. Now, sensitivity analyses have to be performed using R or Matlab Toolbox. We are happy to help out, if you need support, please contact customer support. · 47-6596 Support other delimiters that ";" when reading csv files. · 47-6352 Update from BuildingBlock, removes simulation from "Folder"
· 47-6743 No standard deviation for PK parameters in simulation results? · 47-6780 It is possible to create simulations and save project while in "Read-Only" mode. · 47-6777 Input fields are not disabled in Read-Only mode. · 46-6667 Exception when importing observed data from an excel-file without entries. · Installing SB Suite on Windows 2008 Server requires a manual installation of .NET Framework 3.5 SP1 (download from Microsoft: http://www.microsoft.com/en-us/download/details.aspx?id=25150). 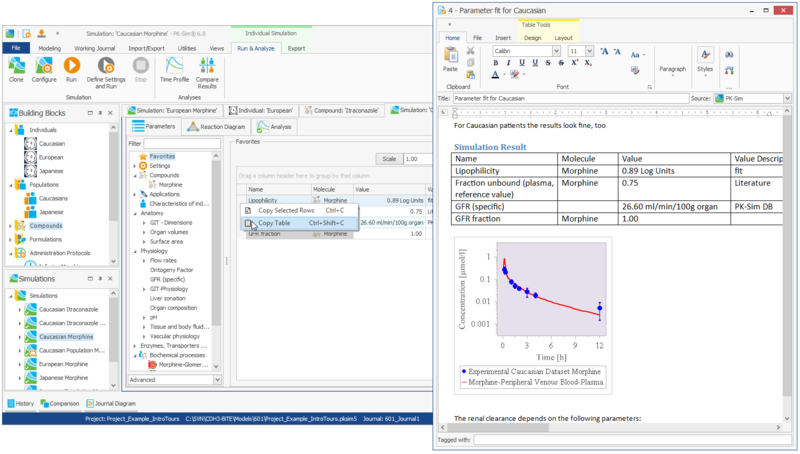 The former Matlab-based population simulation toolbox also supported a parameter sensitivity analysis. This feature was decommissioned. Now, sensitivity analyses have to be performed using R or Matlab Toolbox. We are happy to help out, if you need support, please contact customer support. Installing SB Suite on Windows 2008 Server requires a manual installation of .NET Framework 3.5 SP1 (download from Microsoft: http://www.microsoft.com/en-us/download/details.aspx?id=25150). R The redesigned and extended Import/Export feature was already launched in 5.3.1. It is described in Chapter 20 of the Systems Biology Software Suite manual. The Import function allows the user to import individual and population simulations that have been modified outside of the PK-Sim environment, for instance in MoBi. As a result, the user will be able to combine models that were enhanced outside of PK-Sim with populations built in PK-Sim. In addition, the user will be able to simulate advanced scenarios, e.g. if a model was enhanced or built in MoBi to simulate a DDI, the user can import such a model into PK-Sim and perform a simulation. · The function describing the ontogeny for the UGT1A1 enzyme was optimized. This was realized by an improved fitting function of the established data set. 46-5597 In MoBi, observer of fraction metabolized may be calculated wrong in projects converted from 3.2 to 3.3. · The SB Suite is not supported in Windows XP (and previous), but installation is not prohibited. However, execution will fail (#47-5950). · Analysis: Graphical display of parameters and output can be chosen from e.g. time-profile analysis for concentration-time profile, box whisker, scatter and range plots to visualize distribution of values in a population. This is complemented by flexible grouping feature with either default or customized values for binning and labelling. 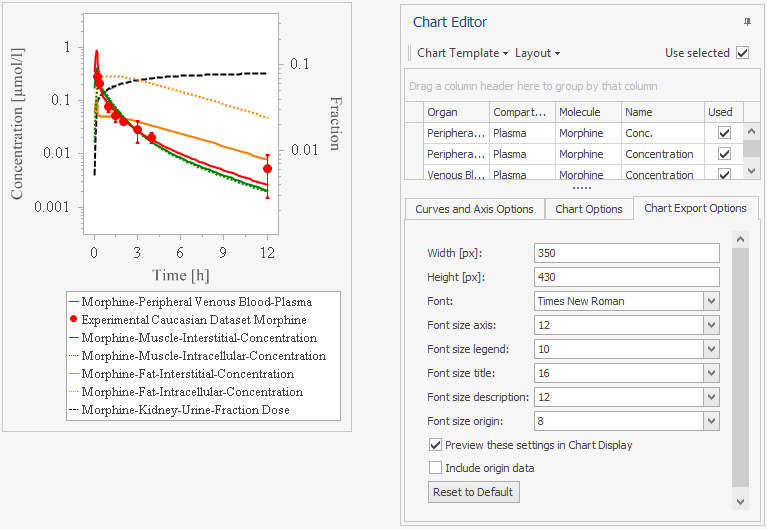 Different populations and corresponding analyses can be transferred into a comparison chart by “Drag and Drop”. Definition of a reference population is useful to compare e.g. variability within subgroups of a population. · PK-Sim models can be extended in MoBi (e.g. adding a tumor) and re-imported into PK-Sim for population simulation studies. · Results, and user defined analysis plots are reported to pdf documents. · Simulations are performed in parallel on workstations with multiple cores. Import/export capabilities facilitate the use of high performance compute clusters. 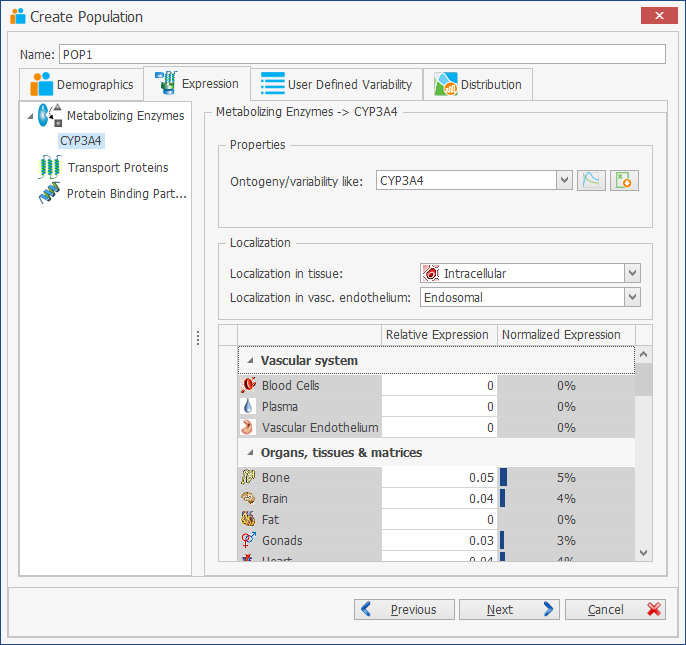 All population simulation functionality is moved from the former ‘Pop Toolbox’ into PK-Sim. Thereby, the Matlab based Toolbox is not supported any longer. 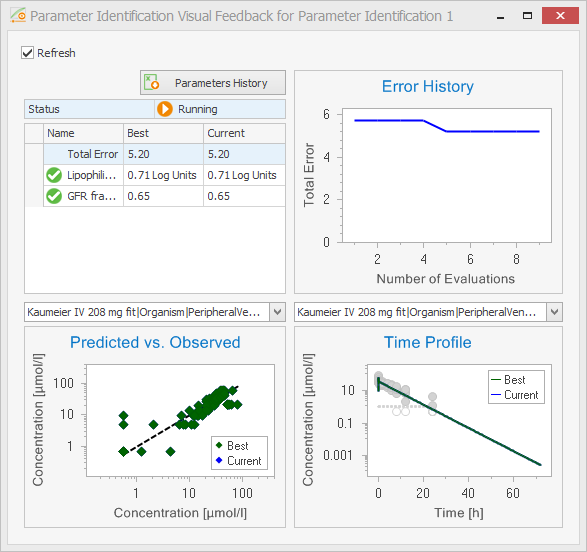 The Matlab Parameter Identification Toolbox is still available and supported, likewise the MoBi Toolbox for Matlab and the R Toolbox. · In certain situations, MoBi fails on submitting changes in the simulation back to the building blocks (#46-5721). · The previous, Matlab based population simulation toolbox supported, in addition, a parameter sensitivity analysis. This feature has been decommissioned. Sensitivity analyses have to be performed now using the R or Matlab Toolbox. If you need support in using this please contact customer support. · Installing SB Suite on Windows 2008 Server requires a manual installation of .NET Framework 3.5 SP1 (downloadable from Microsoft: http://www.microsoft.com/en-us/download/details.aspx?id=25150). · The SB Suite is not supported on Windows XP (and previous) versions, but installation is not prohibited. However, execution will fail (#47-5950). In case of occurrence, click OK and the installation will continue without problems. After Installation under Windows 8, the computer needs to be restarted. Special characters on Asian systems may lead to incompatibilities with toolboxes on data import. A workaround is described in the manual (Chapter 39.1.3. Data Definition). In PK‐Sim 5, the transit through the small intestine has been defined as a colon arrival time (CAT, or orocaecal transit time, OCTT), corresponding to the time after dosing at which 50% of the drug mass has entered the caecum. This colon arrival time, thus, includes the gastric emptying time (GET), defined as the time at which 63% of drug mass has left the stomach. However, for high GET values in combination with low CAT values, the differential equations cannot be solved because then the GET exceeds the CAT. In this release the problem is fixed by separating the CAT and GET, i.e. switching to a small intestinal transit time (SITT), defined as the time span between gastric emptying and colon arrival. Improvement: Excel import of observed data can import text files with arbitrary column separators as well. Large gastric empting time (GET) values cause difficulties in solving differential equations. In PKSim 5.0, the transit through the small intestine has been defined as a colon arrival time (CAT, or oro‐caecal transit time, OCTT), corresponding to the time after dosing at which 50% of the drug mass has entered the caecum. This colon arrival time, thus, includes the gastric emptying time (GET), defined as the time at which 63% of drug mass has left the stomach. However, for high GET values in combination with low CAT values, the differential equationscannot be solved because then the GET exceeds the CAT. Working with larger models and going through longer MoBi sessions may result in "Out of memory" errors, depending on the computer configuration. It is always advisable to periodically save backup copies of the current project. Changing minimum values of a uniform distribution may affect the maximum value of the distribution as well (#5131). The GUI of the toolboxes may cause problems when window items are clicked before their buildup is completed. Red warning texts describing ongoing computations are displayed to remind the user to be patient. Only continue your work after a window or tab is displayed completely, in particular on slower computers. The path to the Ghostscript tool should be automatically set. If you receive an error message referring to the "PS2PDF" functionality, please check your user settings. If the path to the program "gswin32c.exe" is empty, you need to insert it manually. Typically, it can be found in the Program Files directory, like "C:\Program Files\gs\gs9.00\bin\gswin32c.exe"
For table parameters the getParameter function has a new option timeProfile to get interpolated values from underlying table. GUI has been improved in stability, user friendliness and optic. For datasets the user can set a LLOQ value which is then shown in the time profile plots. When plotting takes place the figures are not visible anymore and a progress bar informs the user about progress. GUI has been improved in user friendliness and optic. The software manual has been revised from draft to final status. The expression database descriptions have been revised. Building block concept: „Individual/Population“, „Compound”, “Administration Protocol”, "Formulation", „Event“ set up as separate and re-usable units. A more detailed description of the newly available features can be found here. Project files have been restructured to decrease size. However, this causes that files generated or saved with PK-Sim 4.2.4 cannot be read by older versions (of course, the new version reads older versions though). New Species - Beagle dog. To see a detailed list of all newly available features in PK-Sim® 4.2 just click here. To see a detailed list of all newly available features in PK-Sim® 4.1 just click here. CYP2C19, CYP2C9, CYP2C8 and CYP2B6 have been added to the Clearance Scaling Module. Calculation of organ/plasma partitioning coefficients according to the methods of Rodgers and Rowland (Rodgers and Rowland, 2007) or, optionally, according to the PK-Sim® standard method. New internal model structure allowing the incorporation of custom PBPK models. Quicker loading and saving of project files. Asian Population (Tanaka, 1996) was added to the PK-Sim® population data base. PK-Sim® now works with OS set to non-latin typesets (e.g. Japanese). 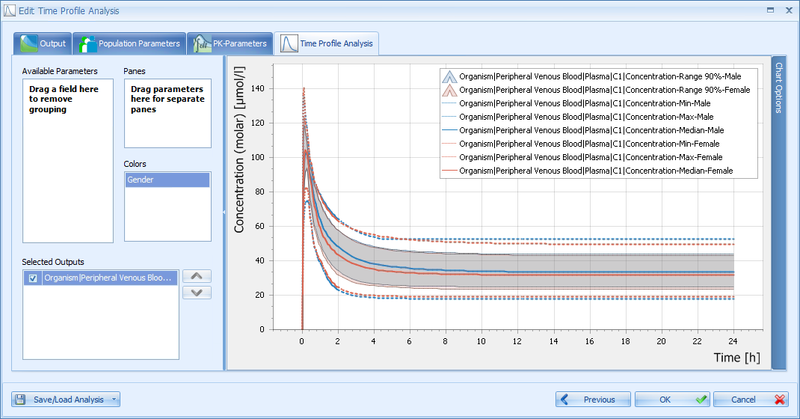 Export of PK-Sim® simulations to our new modeling and simulation tool for biological systems MoBi®. The new Statistics Tab allows the user to easily generate bias (+ 95% Confidence Intervals) and precision values to quantitatively compare a simulated curve to observed data. A linear regression analysis can also be performed for the simulated vs. observed data. The monkey is now included as an additional species. Global options are now saved per user. 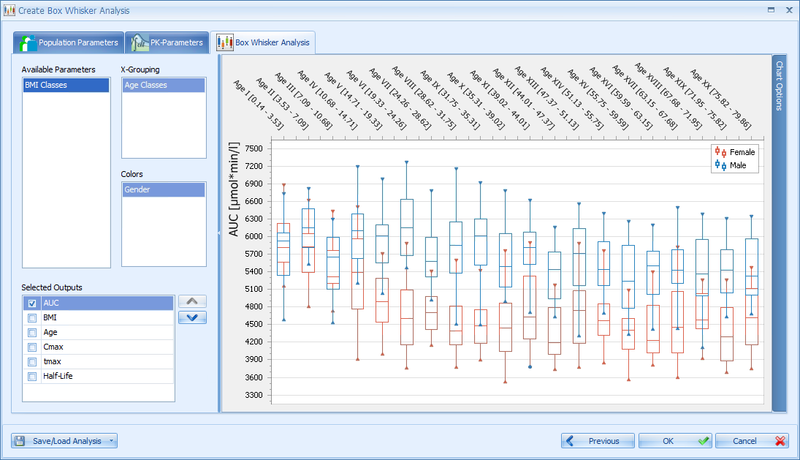 Concentration unit saved for each plot window separately. Fraction unbound will be updated after loading a compound from the master or project database. Possible problems while loading projects are fixed. 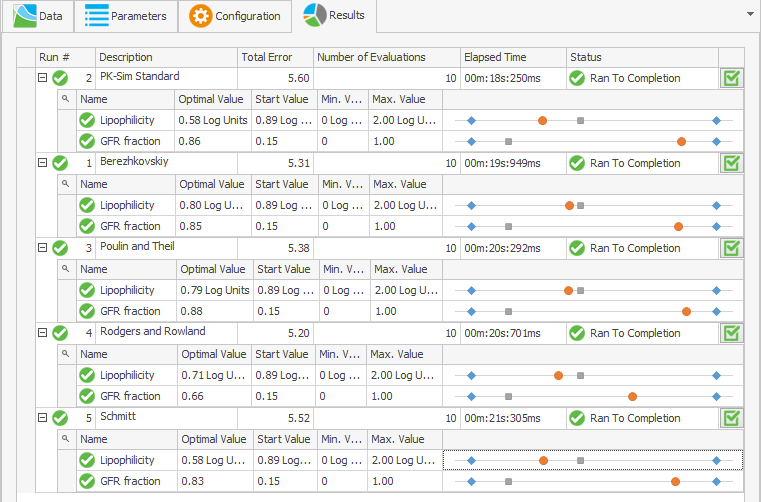 User defined settings for distribution parameters saved for use in PK-Pop simulations. Clearance Scaling in Children: A clearance scaling module that calculates age dependent clearance in children based on the known adult clearance value and the proportions of eliminating mechanisms involved has been implemented as an add on module in PK-Sim®. 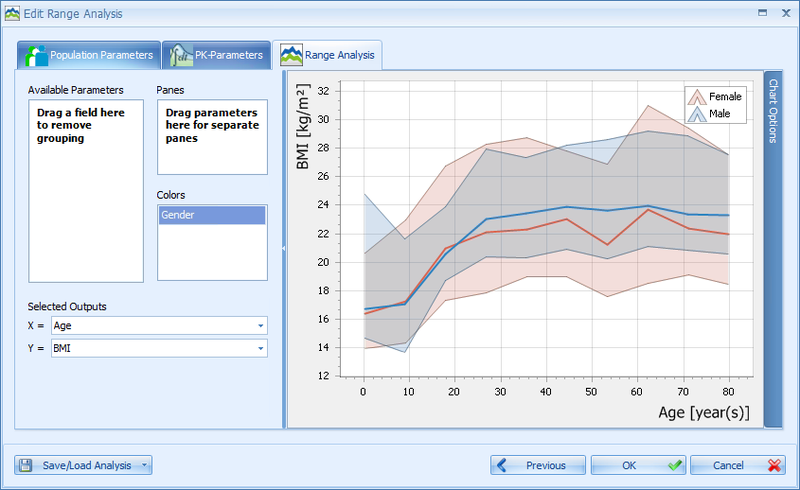 pH Dependent Solubility: Solubility vs. pH is now calculated by PK-Sim® based on pKa values of multiple acidic or basic groups. The solubility vs. pH table can further be edited to make use of existing experimental data. New Dissolution Module: The new dissolution module calculates the dissolution dynamic of a sold particle formulation moving down the GI tract and is dependent on the particle size distribution and pH-dependent solubility. Different options, such as how the precipitated drug material is treated, are available. Flexible Administration: The compound can be administered by pre-defined uptake functions (zero- and 1st-order) as well as arbitrary source functions in the form of user-defined mass-time tables into any (sub-)compartment of the model. This flexible administration scheme can be used to model dermal, inhalation, parenteral and other types of administration. Output of Percentage Metabolized: The fraction of the administered dose metabolized is calculated as additional output. This information is available for each specified metabolic process. 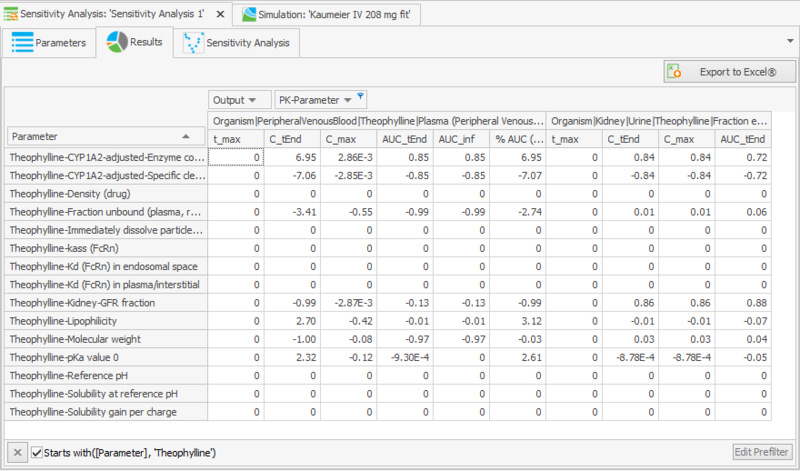 It is now possible to model metabolite kinetics in a separate PK-Sim® simulation by inputting the time course of metabolite formation within the (sub)-compartment where metabolism occurs. Re-Organization of the Graphical User Interface (GUI): The GUI has been re-structured in an even more intuitive manner. The simulation parameters are now organized into four categories: Species, Absorption, Distribution, and Metabolism & Excretion. The input forms for active transporters and metabolism are dynamic and offer more flexibility with respect to the number and type of active process. Read-Only Mode: PK-Sim® V3.0 can be run in a read-only mode when no valid license is present. 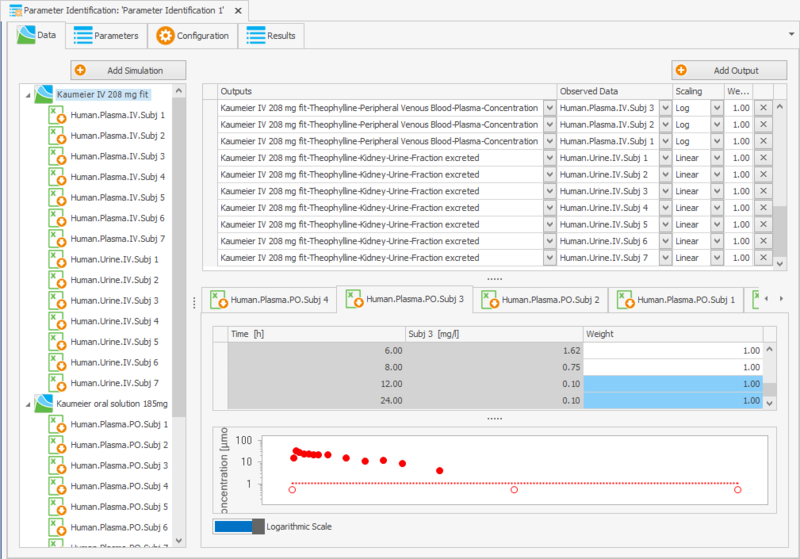 The read-only mode provides full access to all previously generated PK-Sim® projects and output data, but does not allow for parameter changes or simulations to be run. PK-Sim® Absorption Package: A new basis package of PK-Sim® has been released. The Absorption package simulates the gastro-intestinal transit and absorption process and serves the needs of scientists involved in biopharmaceutics and formulation development.